Besides creating visual images of great beauty, Maria Sibylla Merian wrote scientific pieces that revolutionized both botany and zoology. This engraving is one of 82 that were based on the meticulous sketches and field notes Merian made during her two years in the Dutch colony of Suriname in South America. While there, she studied insects and animals in their natural habitats and made detailed records of native plants. Merian described the pineapple as the “most outstanding of all edible fruits,” which may explain its place as the first illustration in her publication. 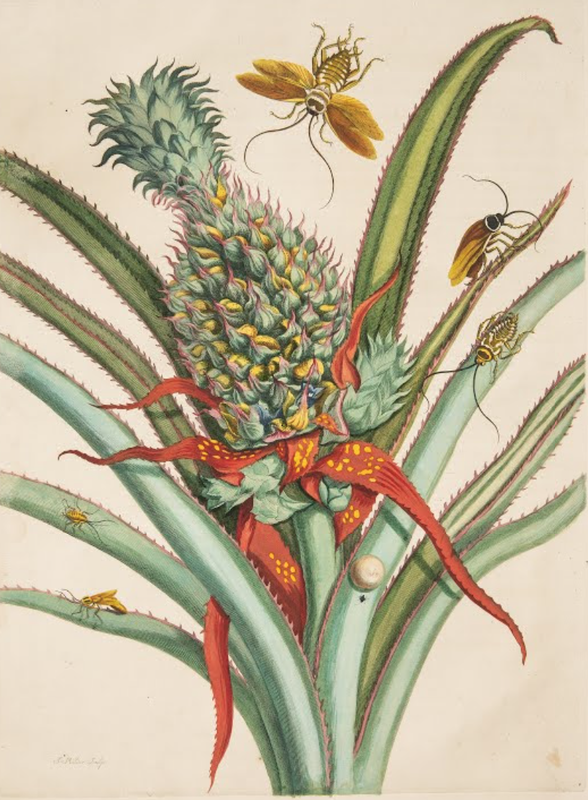 She also noted that cockroaches are partial to the sweet fruit and cause devastation to all of Suriname’s inhabitants by “spoiling their wool, linen, food and drinks.” Merian’s drawing features two types of cockroaches that lay their eggs in distinctly different manners.